Bali, October 24, 2014 - The 4th Archipelago Culinary Fest 2014 & Job Fair is an annual cooking, barista and bar mixing competition combined with a mass recruiting event held in Bali by Archipelago International, one of Indonesia's leading hotel operators with a portfolio of more than 90 hotels, resorts and serviced residences in Indonesia, Philippines and Malaysia. 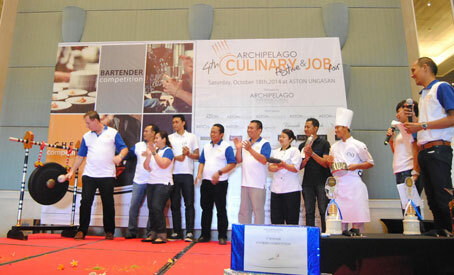 The competing chefs, bartenders and baristas were representatives from Archipelago's eclectic Bali hotel collection which comprises 18 hotels & villas. Held on Saturday, October 18, 2014 at the Aston Ungasan Hotel & Convention Center, the event has attracted much enthusiasm from practitioners and foodies as well as students and job seekers who eagerly applied for employment opportunities with Indonesia's largest hotel group. During the cooking competition, each participant was asked to prepare a 2 course meal consisting of a seafood based appetizer and a meat based main course. The proud winners where I Made Sudarmadi and Dwi Mahendra Saputra, both Senior Chefs with the Aston Ungasan Hotel & Convention Center, whose creations excelled through a straight forward simplicity, good taste and the maximization of locally produced ingredients. The Bartender Competition, was won by Ni Luh Putu Eka Tari from the Kamuela Sanur Villas & Suites which comes to no surprise given the Kamuela's popular Caramel Restaurant and Bar which has a loyal mostly European and quite demanding clientele. The title for Archipelago Bali's best Barista went to I Gusti Bagus Putra Sesana from the five-star Grand Aston Bali Beach Resort. 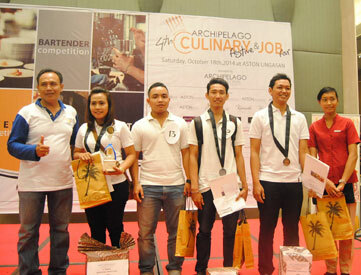 "The Archipelago Culinary Festive has become a regular annual highlight. It succeeds in showcasing our local talent and motivating our Balinese associates to aspire to new heights. As the largest employer on the island it has become increasingly important for us to foster team spirit and a friendly but competitive environment and to recognize overachievers while simultaneously addressing young upcoming job seekers showing them that while employment in the tourism industry might come with hard work and long hours it has definitely its rewards and can result in a satisfying and fulfilling carrier" said Winston Hanes, Archipelago's Bali based Regional General Manager. Opening Ceremony - Seen in the picture from left to right Bapak Winston Hanes - Corporate General Manager of Archipelago International, Bapak I Made Sumardika - Corporate Food & Beverage Manager of Archipelago International, Ibu Febry Mutia Anindita - Corporate Director of Marketing & Communications, and all participants. Bartender Winners - Seen in the picture from left to right Bapak I Made Sumardika - Corporate Food & Beverage Manager of Archipelago International, 1st winner Ni Luh Putu Eka Tari from Kamuela Sanur, 2nd winner I Made Juliawan from favehotel Sunset Seminyak, 3rd winner I Wayan Ceri Arya from Harper Kuta with their medallion and award.